Controlling your favorite outdoor mobile navigation has never been easier and faster – we’re introducing Wear for Locus Map, an application running on Android Wear watches. 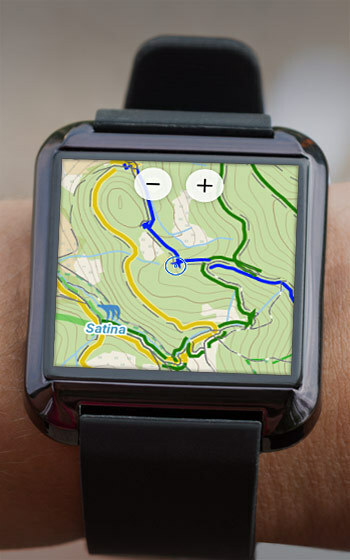 You’ve got your map, track recording controls or navigation right on your wrist! Download Wear for Locus Map in Google Play Store for FREE! first big respect for your work and launch of android wear connectivity with Locus. I use locus pro on my android phone usually for mtb cycling and exploring new routes on terrain. I was thinking about buying android watch (for ex. Ticwatch s) with built in GPS and connect it to my phone. I have few questions, when you pair an android phone with ticwatch s and turn on navigation, is then navigation based on android internal GPS or smartwatch gps? (because inernal phone gps consumes a lot of battery, it would be great that uses watch gps). Hi Danijel, Wear for Locus addon works only as an extended screen of Locus Map running on a smartphone – it is not a standalone app. The addon must be installed on both the watch and your mobile. chtěl bych se zeptat, jak poznám které chytré hodinky mě budou fungovat s aplikací locus. Jsou to vše co mají podporu android? Děkuji. Dobrý den, měly by fungovat všechny hodinky s OS Android Wear. Hi – should I expect the plugin to work with Zenwatch 2? I am wondering because that watch does not have internal GPS. 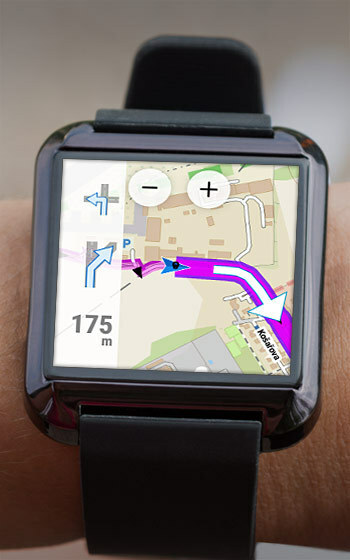 BTW: This plugin would be only reason for me to buy a smartwatch, I am planning to use it as a cycling nav. Hi, the watch doesn’t have to be equipped by GPS – all data is transferred from your phone running Locus. I’m using a Ticwatch E with „Wear für Locus Map“ connected to my Sony Z1 Compact with “Locus Map Pro” installed. On my Sony Z1C I use the “Openandromaps” since years. When I connect my “Wear für Locus Map” (GPS Ticwatch on) to my Sony Z1C (GPS on), the Watch shoes the correct map with my position somewhere in the middle of the display. But… there is the blue mark missing on the display exactly showing my position. If I enable the display on my Sony Z1C and step into Locus Pro the blue position mark is activated on my Ticwatch too… until the display of my Smartphone is deactivated after some seconds idle… then the position mark disappears on my Ticwatch. Have you some hint or idea what may be configured wrong on my Smartwatch and/or my smartphone? I would be happy to find always my exact postion on the Ticwatch marked. Hi, it’s a bug we know about which will be fixed in the next Locus version. For the time being, set “Locus as service” in Locus settings > Miscellaneous. Have you looked into doing a version for Garmin watches? sind diese beiden Uhren kompatibel? Sony Smart Watch 3 is compatible, Samsung Gear S3 is not (different operation system). Funktioniert die App mit der Huawei watch2? Very nice. I have a Smartwatch 3. Is it possible to make the data on the Display configurable? so far, it’s not possible but we plan to add the option of screen configuration in some of future versions. Stay tuned! Any news about screen configuraion? Is an release date for this feature available? We issued a new version 12 days ago. It brought map shifting and support of HW buttons control. Screen configuration is planned for the next release that will be some time in 1-2 months. Prosím, neplánujete to samé pro Garmin hodinky? V mých Fénixech by to Locus PRU slušelo 😉 Děkuji za tuto skvělou aplikaci. Dobrý den, uvidíme, rozhodneme se na základě zájmu. Please make a version for samsung gear watches! Jetzt noch für Tizen, so dass Locus auf der S3 Gear funktioniert. Das wäre ein Traum. It’s great that wear support is now available. Especially for fine grained orientation, the map feature does a great job in my opinion. – It would be great if you could make the map moveable (perhaps Maps-like). – Is it possible to cache the map tiles more aggressively on the clock? Seems the tiles are loaded via bluetooth, which takes a while. Také se pridávám k prosbě pro podporu samsung Tizen! thanks for the feedback. #1: heading course line at the clock is different from what is displayed on your phone? If I have a smartwatch inkluding GPS and Heartrate (Moto 360 Sport), do I need the smartphone for recording tracks? Is it also possible to record the heartrate according to the track? Mir fehlen hier Informationen, auf welchen Smartwatches die App läuft, z.B. auf einer ASUS Zen Watch 2, die ist ja recht günstig? Ich habe bei der Asus den Hinweis gelesen, dass sie nicht mit Drittanbieter-Apps zusammen arbeitet. Trifft das auf Wear für Locus Map zu? Could be interesting to transfer this to Garmin watches (I own the Forerunner 935) which are able to run self-written apps (using a simplified c language) and have have a big plus (some weeks battery time) compared to other watches. Gibt es auch Überlegungen Locus Apps auf Samsung Gear Devices anzubieten? Hi, yes, there are some considerations but not in nearest future, so far. It’s a pity, because today Samsung delivers high-end devices that I think should be part of the nearest future.